Can you overdress a child in the winter? Lurie Children’s Hospital shared with the Daily Herald Newspaper that winter is in full swing in Chicago, and with chilling temperatures, many parents are cautious to protect their children from the cold. But is it possible to overdress a child in the winter? Dr. Kenneth Polin, a primary care pediatrician at Lurie Children’s Primary Care — Town & Country Pediatrics, explains potential side effects of overdressing children and sets the record straight on how probable kids are to feeling the heat in the winter. According to Polin, it is possible to overdress a child, but very unlikely. Older children are most susceptible to overheating and wearing numerous layers since they have a larger surface area than infants. It can be difficult to distinguish whether or not infants are overheated because they are unable to talk. What are symptoms that a child is overheated? “It’s very hard to overdress a child, and there are minimal side effects of heat exhaustion in the winter, but if children are sweating or act irritable and uncomfortable, you need to reassess them to consider if they are overdressed,” he says. Polin advises the best way to determine if children are warmer than usual is to feel their chest, not hands and feet. “The hands and feet may not be indicative of central body temperature, and if children are not wearing gloves in a cold environment, they may feel cold, even if they are hot,” he explains. During cold temperatures, it is often common for parents to bundle their infant in multiple layers, especially in the car. “While driving, it’s unnecessary to dress infants or children in mittens, coats, hats, blankets, etc. I always recommend parents to consider one more layer than they are wearing. If a parent is warm in the car, a child is probably also going to be warm,” he says. Heat rash can also potentially occur if a child is overdressed. This rash appears as small red bumps that are grouped together when a body is very hot, according to the Centers for Disease Control and Prevention. 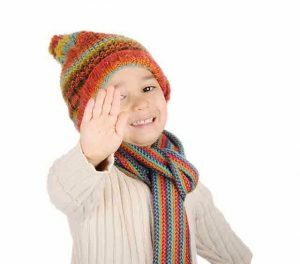 “To make sure a child is protected from the cold without becoming overheated, reassessment is key; parents should periodically check to see if a child appears to be uncomfortable and sweaty,” Polin emphasizes. http://healthylombard.com/wp-content/uploads/2019/01/child-in-winter.jpg 486 640 Juanita http://healthylombard.com/wp-content/uploads/2016/08/hl-logo.png Juanita2019-02-09 04:03:392019-01-30 10:06:10Can you overdress a child in the winter?